It is no longer okay for companies to pay poverty wages and dodge their taxes. For too long, fast food has been synonymous with low pay, poor working conditions and a lack of respect for workers. To bring change to the fast food industry, we need to encourage every single fast food worker to be a part of this movement for change. That is why War on Want have teamed up with the Bakers Food and Allied Workers Union (BFAWU) to encourage every fast food worker in the country to join the campaign for £10 an hour, guaranteed hours and the right to join a union. McDonald’s workers are standing up for change in the fast food industry. 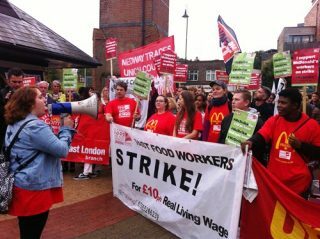 If you, or anyone you know, work in fast food, please encourage them to sign up to the McStrike campaign being run by the Bakers Food and Allied Workers Union to bring much needed change to this industry. It’s time companies like McDonald’s knew that it is no longer okay for them to pay poverty wages and dodge their taxes. They make billions in profit yet are extracting wealth from our poorest communities. And women, black and migrant workers and the communities they live in are the hardest hit. If you work in fast food or know someone who does, please encourage them to sign up with the Bakers’ Union campaign to be part of the change we are all fighting for. War on Want and their supporters have shown solidarity with fast food workers as they stand for justice; War on Want have been part of the fast food rights campaign from the beginning, and know that when workers come together they have the power to create change. McDonald’s workers made history last year when they went on ‘McStrike’ for £10 an hour, guaranteed hours and for their right to a union. And while McDonald’s workers have already won the largest pay rise for a decade, but it really is not enough. Every fast food worker who joins makes the campaign stronger. This year, on international workers day, the McStrike grew, when five stores across the country went out on strike. Now we need everyone to play a part in ensuring the campaign grows, by giving every fast food worker the chance to be part of history. When these workers win, we all win. Please do everything you can to support them. If you don’t work in fast food but want to support the McStrike you can volunteer here.